Mayor Teresa Jacobs met with Orange County’s Technology and Social Media Workgroup to discuss trends in digital marketing and emerging technologies. 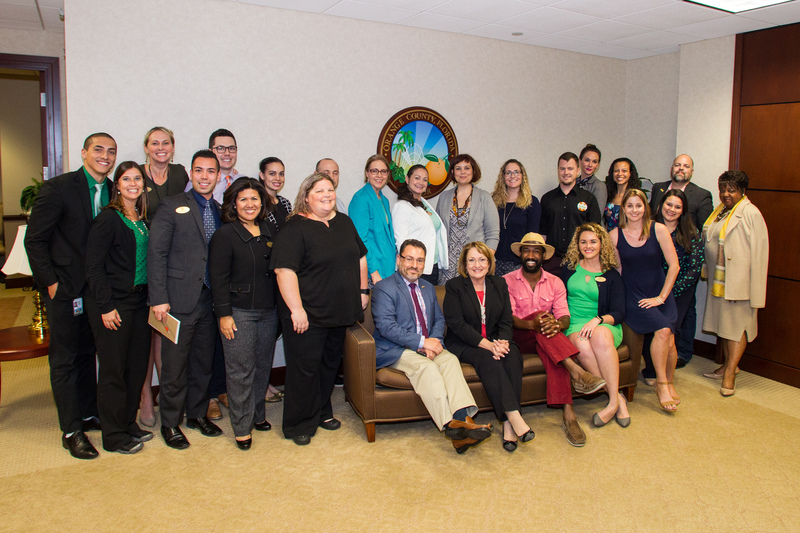 Orange County’s Technology and Social Media Workgroup met recently with Orange County Mayor Teresa Jacobs to discuss emerging technologies and how to better engage Millennials in their government. The gathering also celebrated the launch of Orange County’s new Instagram page. The creation of the Technology and Social Media Workgroup came out of the success of Orange County’s Social Media Ambassadors initiative, which launched during Mayor Jacobs’ 2014 State of the County. The program brought together local, technology-savvy online influencers and now operates as a think-tank on emerging technologies, social media and mobile applications. The group plays a key role in reaching online audiences during signature Orange County events — including the annual State of the County address, the Economic Summit, the Florida Simulation Summit and the Holiday Heroes Toy Drive — by sharing online messages with Millennials and the next generation of community leaders. Since its inception, the efforts of Orange County’s Communications Division with the Workgroup have been recognized by respected industry trade organizations. In October 2014, the Communications Division received Ragan PR Daily’s Top Digital Award for Best Community Engagement, recognizing the groundbreaking success of online outreach efforts with citizens during Mayor Jacobs’ 2014 State of the County address. In April 2015, the group also received the Florida Public Relations Association’s Judges Award for Audio/Visual & Online Tools of Public Relations for outreach during the 2014 State of the County. The Technology and Social Media Workgroup has expanded to represent a broad range of community partners and communications experts from municipalities and industries including education, technology, hospitality and transportation. The Workgroup now consists of 20 members from the University of Central Florida, Rollins College, Valencia College, Central Florida Top 5, Greater Orlando Aviation Authority, Prismatic, City of Orlando, Visit Orlando, Orlando Date Night Guide, City Year Orlando, IDEAS for Us, and MetroPlan. Vargas added that a specialized Workgroup where a diverse group of technology and social media experts can brainstorm innovative ways to reach online audiences is relatively unheard of for a local municipality. “Going into year three, I’m even more excited to see how Orange County will connect the community with each other, the state of Florida and ultimately with our international partners,” Vargas said. To learn more about the Technology and Social Media Workgroup, visit Orange County’s Newsroom. A collection of photos from the workgroup meeting are available on Mayor Jacobs’ Flickr album.